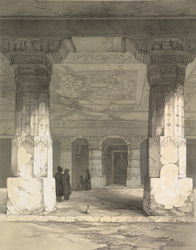 This is plate 6 in James Fergusson's 'Illustrations of the Rock Cut Temples of India'. The wonderful paintings that decorate the Ajanta caves are unique in Indian art and provide an illustration of early Buddhist traditions in the country. Cave 17 in Ajanta is a vihara (monastery) dating from the late fifth century. It houses a large number of mural paintings illustrating Jataka legends, which relate stories of the lives of the Buddha. Fine frescoes decorate the cave's verandah and the colonnaded interior is filled with sumptuous paintings narrating dramatic tales such as the Sutasoma Jataka which tells of cannibalism.